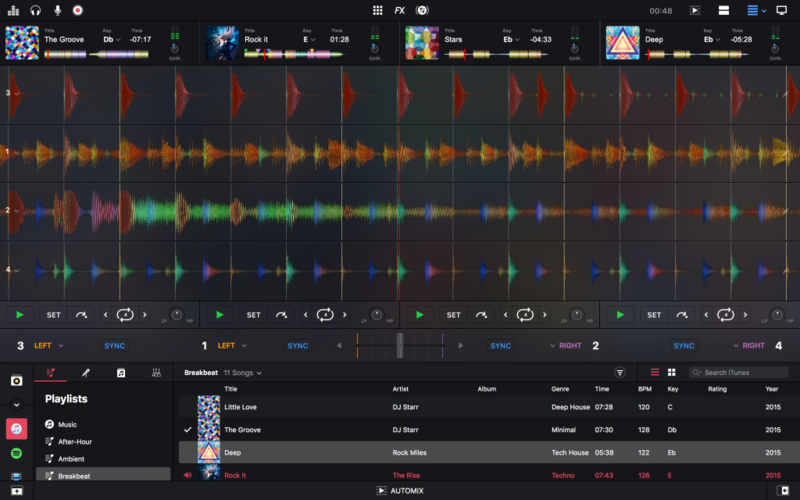 The biggest break from how we’ve normally thought about DJ software comes in the form of automatic mixing and selection tools. One is powered by machine learning working with DJ sets, and one from data collected from listening (Spotify). Automix AI is a new mixing technology. And hold on to your hats, folks, if the “sync” button was unnerving to you, this goes further. When we say “A.I.,” we’re really talking machine learning – that is, “training” algorithms on large sets of data. In this case, that data comes from existing DJ sets. (Algoriddim tells CDM that was drawn from a variety of DJs, mostly in hip-hop and electronic genres.) Those sets were analyzed according to various sonic features, and the automixing applies those to your music. So this isn’t just about mixing two different techno tracks with mechanical efficiency – it’s meant to go further across different tempos and genres. 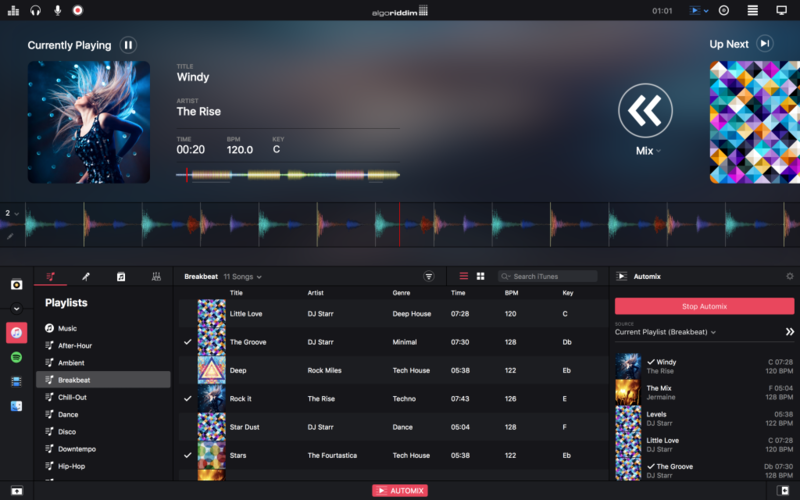 Also impressive: while you might think this sort of technology would be licensed externally, the whiz kids over at Algoriddim did all of this on their own, in-house. On the Spotify integration side, and also related to automating DJing tasks, “Match” technology recommends music based on BPM, key, and music style. Existing Spotify users will be familiar with some of this recommendation engine already. Where it could be good for producers is, this means there’s an avenue by which your music gets exposed by algorithms. And that in turn is potentially good news, if you’re a producer whose music isn’t always charting the top of a genre on Beatport. These “autopilot” features are all under your control, too: you can choose which parameters are used, choose your own tracks, switch it off at will – as you like. Or you can sit back and let djay Pro run in the background while you’re doing something else, if you want to let the machine do the DJing while you cook dinner, for instance. 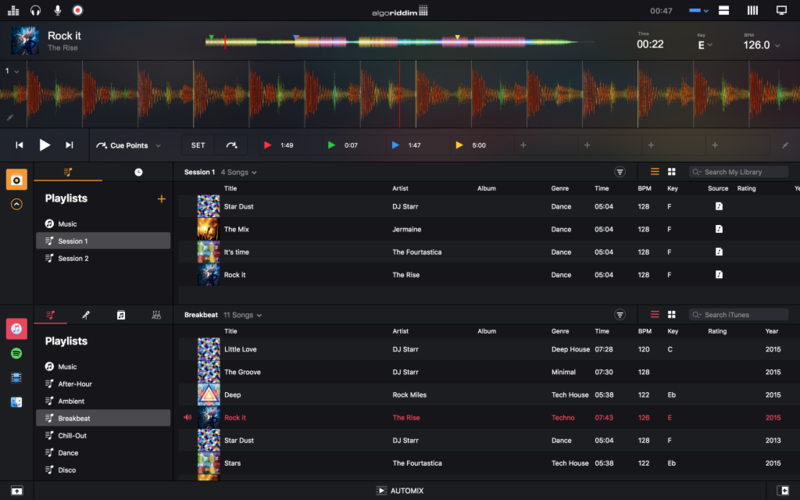 But one of the disruptive things about Algoriddim’s approach to DJ software is, it has simultaneously challenged rivals both among entry level and casual users and more advanced users at the same time. So, here’s the more “Pro” sounding side of this. 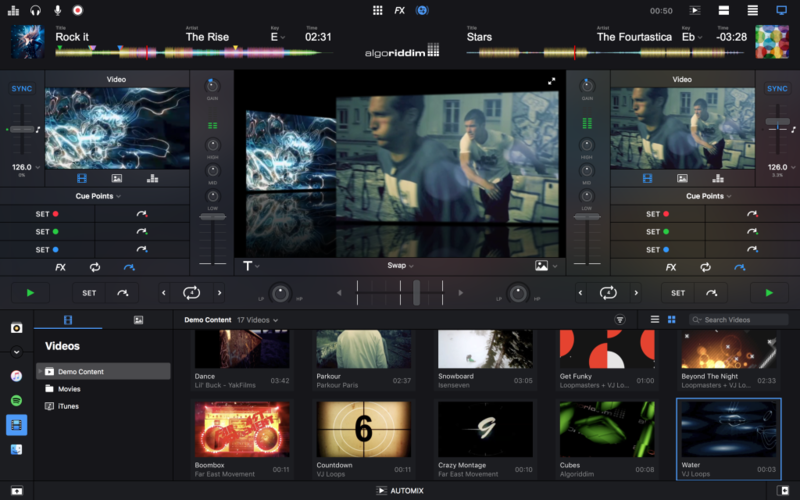 Some of these are features that are either missing or not implemented quite the way we’d like in industry leaders like Serato and Traktor. A new audio engine with master AU plug-ins. A rewrite of the engine now allows high-res waveforms, post-fader effects, higher-quality filters, plus the ability to add Audio Unit plug-ins as master output effects. Integrated libraries. iTunes, Spotify, and music in the file system / Finder are now all integrated and can be viewed side-by-side. Integrated library views bring together everything on your local machine as well as Spotify. Keyboard Shortcuts Editor. There’s a full editor for assigning individual features to custom shortcuts – which in turn can also map to custom hardware or the MacBook Pro Touch Bar. CDJ and third-party hardware support. 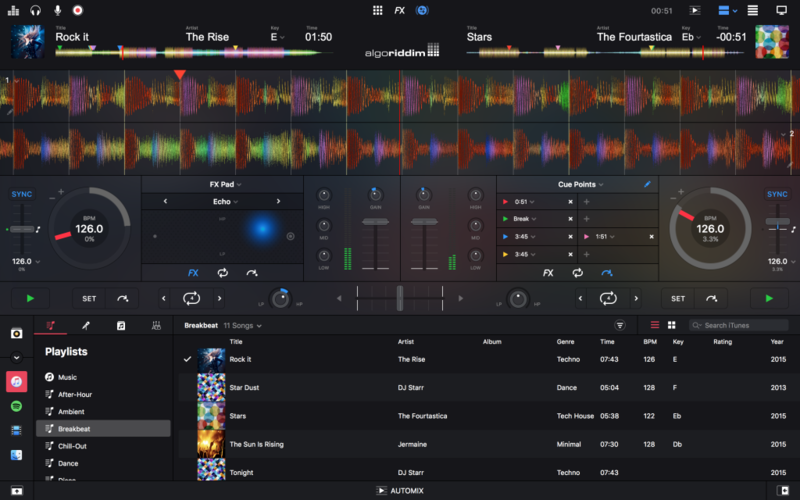 Whereas some other players make their own hardware or limit compatibility (or even require specific hardware just to launch, ahem), Algoriddim’s approach is more open. So they’re fully certified by Pioneer for CDJ compatibility, and they include 60 MIDI controllers in the box, and they have an extensive MIDI learn function. More cueing and looping. Version 2 now has up to eight cue points and loops, with naming, per song. (I recently lauded Soda for adding this.) You can also now assign loop triggers to cue points. Single deck mode for preparation. Okay, some (cough, again Serato) lock you into this view if you don’t have authorized hardware plugged in. But here, it’s designed specifically for the purpose of making set prep easier. Accessibility. VoiceOver support makes djay Pro 2 work for vision-impaired users. We really need more commitment to this in the industry; it’s also been great to see this technology from Algoriddim showcased at Apple’s developer conference. If you’re using this (and hopefully CDM is working well with screen readers), do let us know. New photo / still image support. Back to less club/pro features, the other breakthrough for casual users, weddings, and commercial gigs is photo integration. Drag and drop photos or albums onto the visual decks, and the software will make beat-matched slide shows. 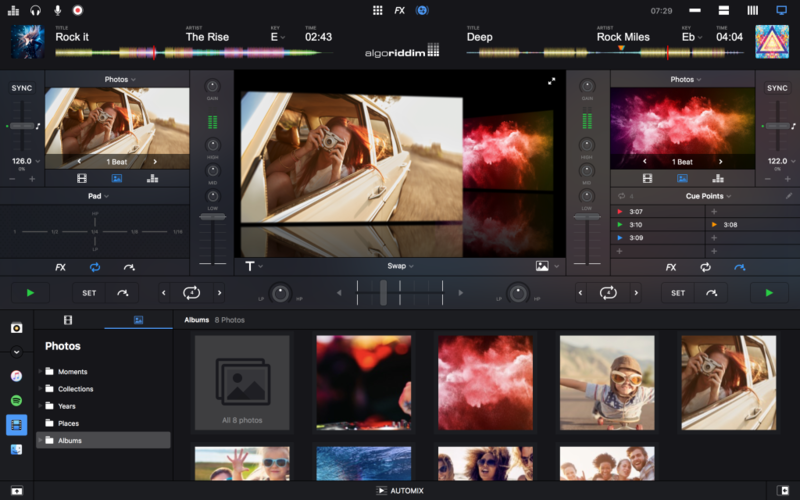 The photo decks also work with existing, fairly powerful VJ features, which includes external output, effects, and the like. You can also adjust beat sync. Still image support builds on an existing video/VJ facility. The other thing that’s disruptive about djay Pro 2: price. It’s US$49.99, with an intro price of US$39.99, on the App Store. You’ll need Spotify Premium for those features, of course, and macOS 10.11 or later is required.